I might have the same reaction. I said the double-releases wouldn’t last, but no one believed me! THEY NEVER BELIEVE ME. Bah. At any rate, more Magic Gunner for your reading pleasure, and believe me when I say this series works just as well as a stand-alone manga. 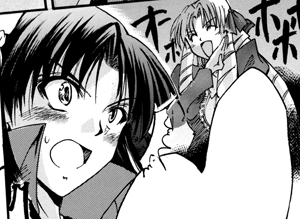 Sure it’s a little unpolished, but hey, that’s what you get with doujinshi. Day ten (of twelve) – Double-Feature! Day twelve (of twelve) – The End. 2 Comments on "Day Eleven (of twelve) – FAT MAN IN A LITTLE COAT"